Hurricane Irma has intensified into a Category 5 storm, the highest designation, and is carrying winds of 180 mph. The storm is believed to be the strongest hurricane ever to hit the Atlantic outside the Caribbean and the Gulf of Mexico. The National Weather Service is calling Irma “potentially catastrophic” and “extremely dangerous.” Florida Gov. Rick Scott has declared a state of emergency as rainfall predictions call for up to 12 inches. The hurricane is already doing damage to companies that depend on recreation and tourism. Hurricane Irma is expected provide the second installment of a disaster that started about a week ago with Hurricane Harvey. Hurricane Harvey dumped more than 51 inches in parts of Texas and caused an estimated $190 billion in damage. Several cruise companies had to change plans when Harvey shut down a port near Houston and are now making changes again due to Irma’s anticipated path. It is estimated that as many as 40,000 passengers who are either currently at sea or planning to depart within the next week will be affected by the changes. Already more than a dozen ships operating in Florida and the Caribbean have been affected. Officials from Norwegian Cruise Line says that the company is making itinerary adjustments and canceling two cruises to ensure the safety of it passengers. Impacted ships are the Norwegian Escape and Norwegian Sky. All other Norwegian ships are currently sailing as scheduled. 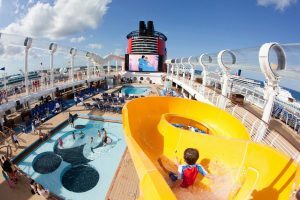 Disney Cruises has altered itineraries for the Disney Dream and Disney Fantasy. Celebrity has changed several ports of call on the Celebrity Equinox itinerary. MSC Cruises has altered the itinerary for the MSC Divina, but no additional changes have been reported. Carnival has announced revised itineraries for three lines: the Carnival Glory (Miami), Carnival Magic (Port Canaveral) and Carnival Splendor (Fort Lauderdale.) Carnival said it made the changes “in order to ensure our ships maintain a safe distance from the storm.” The company said Tuesday that there have been no cancellations. Royal Caribbean altered the itinerary for the 5,400-passenger Allure of the Seas and cancelled two sailings scheduled to depart on Friday. Affected ships are the Majesty of the Seas (Port Canaveral) and the Enchantment of the Seas (Miami.) Shares of Royal Caribbean and Carnival were both down more than 4 percent Tuesday.